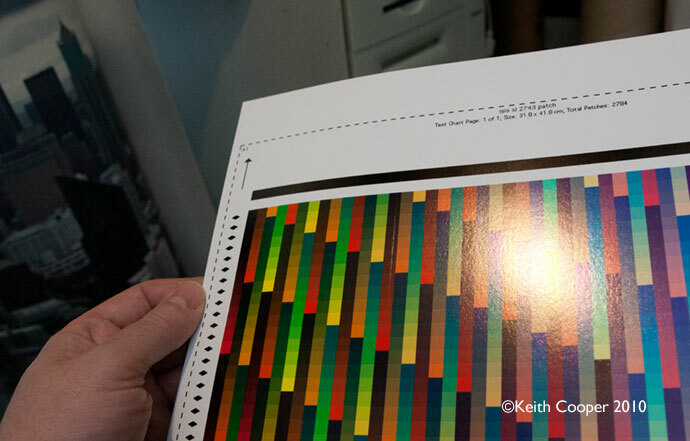 We’ve got an iPF8300 printer at Northlight, and Keith Cooper will be maintaining this page with information based on our experiences of using it at Northlight Images. 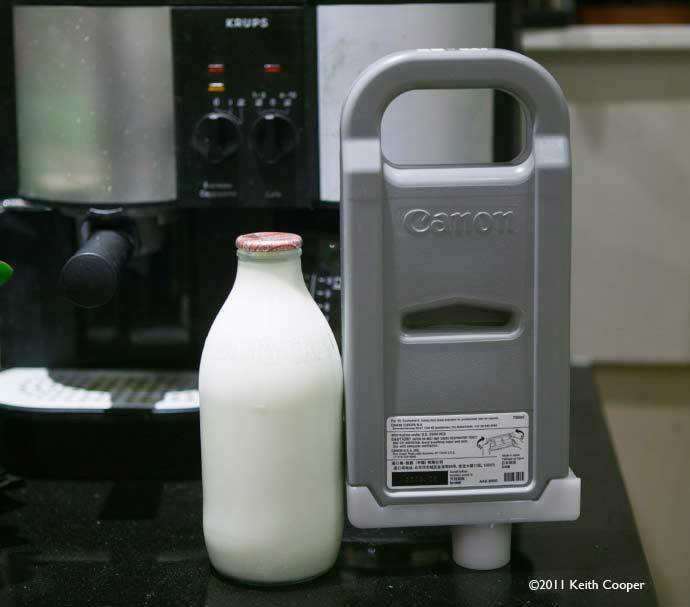 A more detailed review of using a Canon iPFx300 series printer can be found in Keith’s detailed iPF6300 review. Some of our own observations and useful info we find. Sheet feeding and B/W– 10th Nov.
Assorted observations – 14th Nov.
More papers – 14th Nov.
64 bit support – 16th Nov.
Platen Switch – 23rd Nov.
Another thick paper – 24th Nov.
Large prints – 27th Nov.
A very thick paper – 28th Nov.
Accounting – not quite there yet – 2nd Dec.
Accounting and custom media – 7th Dec. 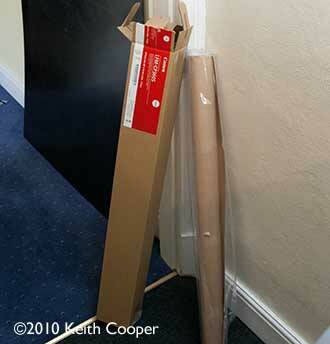 Memo to Keith – use flat paper -14th Dec.
Borderless on 42″ paper – 2nd Dec. 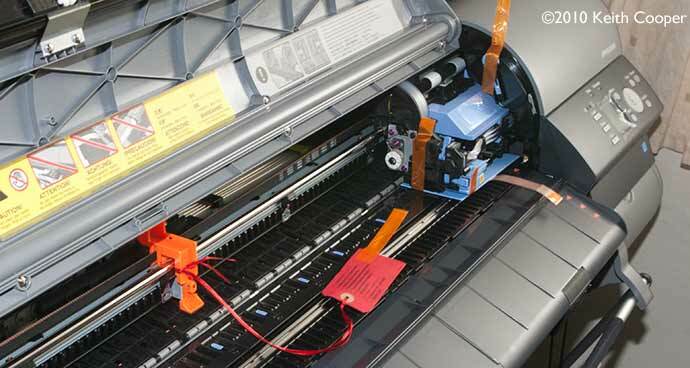 This page covers the iPF8300 44″ width printer (with internal disk). 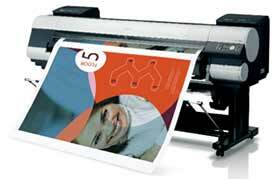 For a smaller 24″ print width version you would have to look at the iPF6300. 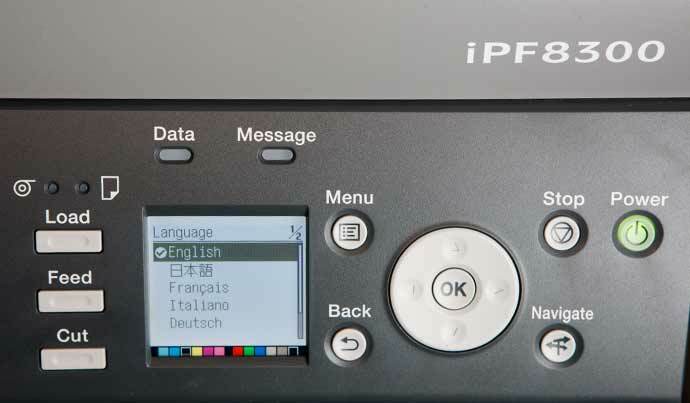 The iPF6350 is a 6300 printer with an 80 GB internal hard disk. At Northlight, we’re driving the printer from OSX Apple Macs. However, the functionality and software is very similar if you happen to be using a Windows PC. I was asked how big the printer is. 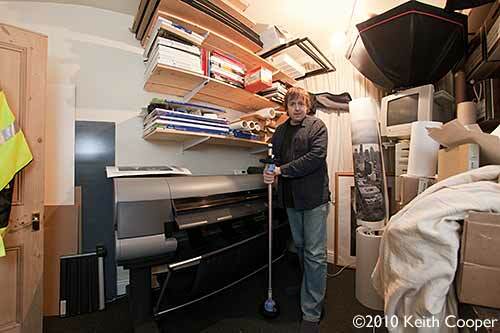 Here’s me standing next to it, holding the 44″ roll paper holder. Only problem is that our print room isn’t very big, so I’ve used a 15mm fisheye lens and then ‘fixed’ the image with the extremely useful Fisheye Hemi PS plugin. The printer is quite large – it took three people to take it upstairs to our print room. First, the stand was put in place and then the printer itself placed on the legs. 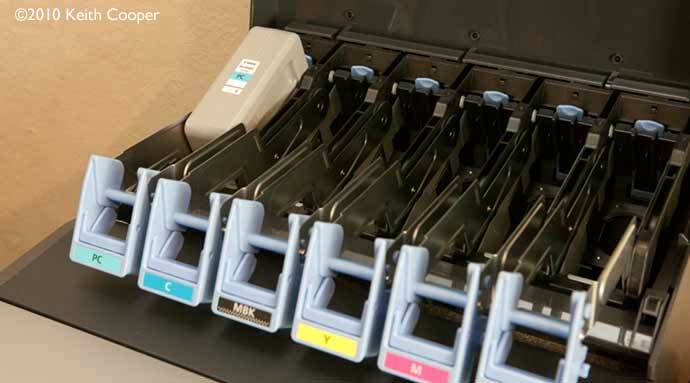 The printer comes with 12 ink tanks – 330ml per colour. These are huge ink carts – the same amount of ink in each one as a can of Coke… There is some 3 litres of ink in the printer. 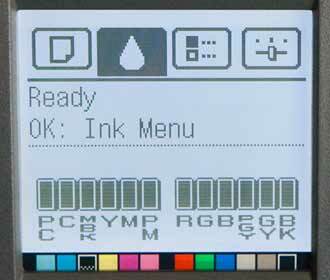 When I reviewed the iPF6300, it turned up already loaded with ink, so I didn’t get to install print heads and ink. The printer is shipped with a lot of things secured with orange tape. At power-up, I resist the temptation to set the interface to a different language. The printer takes a minute or two, to get itself ready. First task is to install the two print heads. Lifting the second set of clamps allows the heads to be fitted. They fit very comfortably and easily in place. The picture shows one head in place. 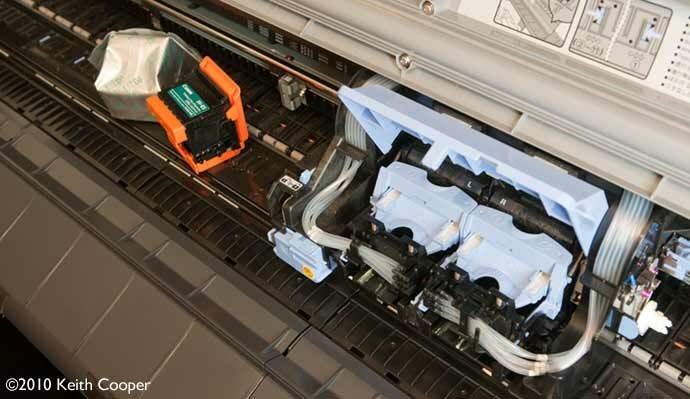 Once fitted, the printer takes a short while to ready itself for fitting the ink tanks. There are places for six tanks at either side of the printer. Each tank is placed in the holder and lowered into place. You need to push the blue handles down quite firmly to engage the ink feed. A red LED lights to show that a cartridge is correctly placed. The ink now needs to be pumped through the various lines and into the heads. Once loaded with ink, the printer needs to work out the alignment of the print heads I fitted. This needs doing to much better accuracy than the mechanical tolerances of the head mounting fittings. 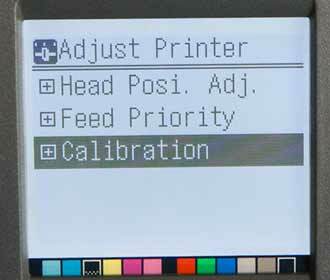 To achieve this, the printer prints various alignment patterns and measures them. The process is fully automatic, but needs some paper loading. 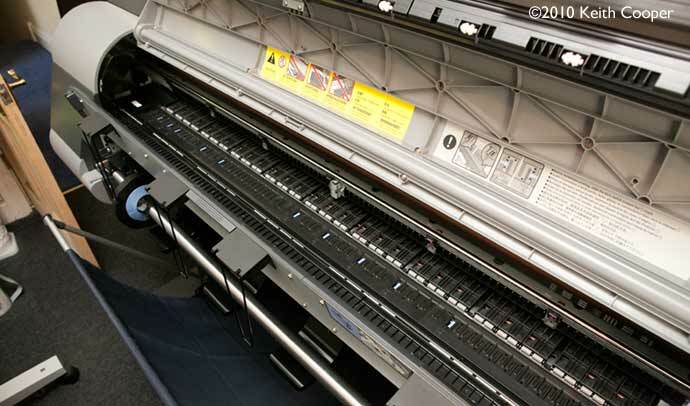 The iPF8300 is front loading – it does not have a direct through print path. This isn’t a problem for myself, since I don’t print on rigid substrates. You can see the roll holder beneath the printing area. 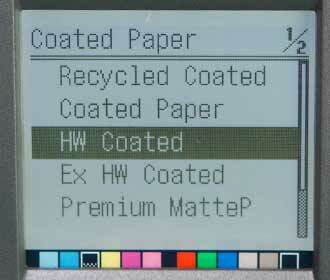 A roll of ‘HW Coated’ paper is supplied with the printer. The printer needs to be told what paper you are loading. The supplied paper is on a 2″ core. The combination of short length roll and 2″ core means that the paper has a very pronounced curl. This curl makes it quite trick to feed the paper through initially – now I know this, I’d bend the leading edge upwards to make it easier to feed. I’ve also made a mental note to avoid roll media on 2″ cores where possible. When finished (another 10-15 mins), don’t unload the paper. 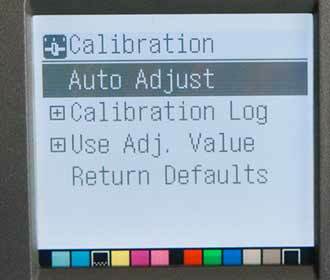 Keep it in place to calibrate the print heads – this is a very important step that will improve the accuracy and repeatability of your printing. That’s it – the printer is ready. I’ve found it on the network, checked I have appropriate software and profiles installed and am ready to print. 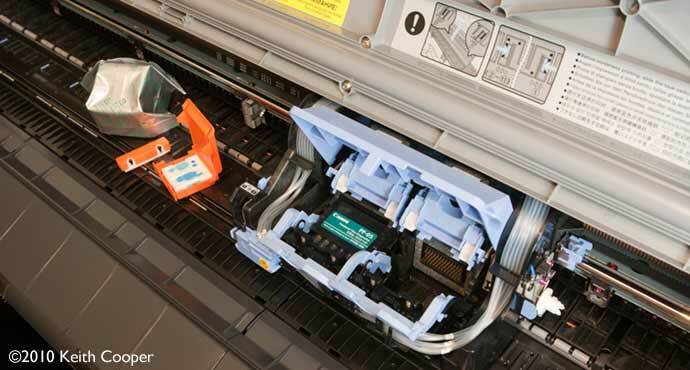 Ink charging always eats up maintenance cartridges, but the one on the printer is hefty enough for me not to worry for some time. The printer works just like a bigger version of the iPF6300, so I went back over my review to remind myself what needed sorting out with network settings, drivers and paper profiles. Below is my first quick test print (20″x12″) – it’s a view of Mt. Rainier poking through the clouds, taken from a plane shortly before landing at Seattle, early one evening. A very nice printer indeed. I’ll be writing further notes, on this page or linked from the table of contents at the top, as we find out just what the printer is like to use. I need to produce some B/W prints for a client in a few weeks, and wanted to see how the Canon B/W print mode would look with the particular paper required. Now I’m pretty confident that it’ll be OK, or else I wouldn’t have got the 8300. However, I do want to see what the image will look like with Innova IFA11 Smooth natural white paper. This is front feed only with the 8300. You need to set the paper type, raise the platten (big lever at the RH side) and position the paper, aligning it with the orange marks. Upon putting the cover down, the paper is ingested and measured. You can see the marks at the RH side, and also, under the platten mechanism, in the bottom LH corner of the picture. I’ve loaded a sheet of innova IFA-11 and, after looking at the suggestions on the Innova site, have selected a media setting of fine art textured. 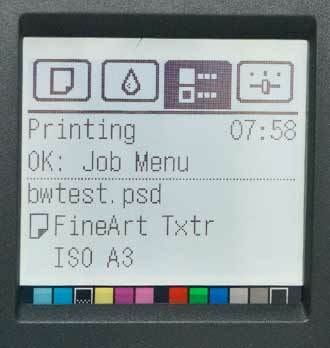 The printer has some very useful tools for setting media types (see pt2 of the 6300 review) but I’m going to pick the Innova suggested setting for this quick test. One thing I noticed was the slight indecision in the print time estimate. First around 8 minutes, and then only seconds later, 3 minutes. I’m assuming that the first estimate was for an A3 page, whilst the second was when the printer realised that I was only printing on part of the paper. It’s good, but I notice slight non-linearity in the bulls-eye pattern, and the print is slightly too dark in many areas. The results are much better, and based on my knowledge of the test print and use of this paper in the past, perfectly adequate for my upcoming print job. Of course, I may refine this in future and will be looking at the True B&W software over time. If you’re wondering how much difference a linearising profile makes, move your mouse over the image below to see the ‘corrected’ version that was sent to the printer. I also used the making of this correction profile to test how long you need to wait before measuring a print. On this paper D-max went from 1.59 15mins after printing to 1.61 after 4hrs and 1.62 by 8 hrs. My preference is to leave things overnight, although Canon tell me that with glossy papers there is not much change after half an hour. Get some cotton gloves – due to the way the paper loads from rolls and sheets, you are much more likely to touch the printed surface. Canon, please get the accounting software option fixed for Mac users. 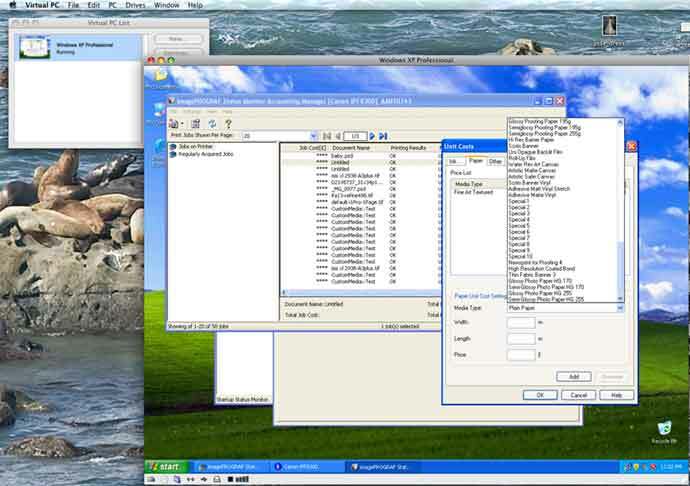 I just installed an old WinXP copy of Virtual PC on one of our old PPC 10.4 Mac servers – I can now use a remote desktop connection to open a copy of the WinXP software running on an emulator, on a server in another room. Clunky, but I can at least now use the accounting s/w to work out costs if I’m doing a load of print work for someone. Several times now I’ve had an obscure ‘blue platten switch is dirty’ message appear on the display – lifting the front cover seems to fix it – I’ll look at the manual! 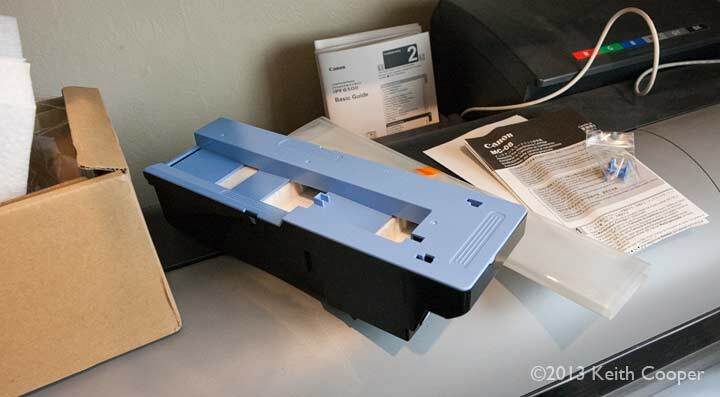 It seems that there are loads of blue platten switches – this reminded me to read more of the manual, and also that the platten below the area the print head moves is freely accessible, so will collect overspray and some ink during automatic maintenance activity. This area is easily cleaned with the little cleaning brush, or a paper towel. I happen to like Innova Ultra Smooth Gloss paper (IFA-49), which means I have several boxes and a 24″ roll of the stuff in the print room. 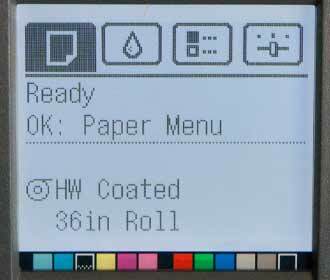 As I know from testing the 6300, it’s quite easy to add custom paper types to the paper menu. Looking at the Innova suggested paper settings, I see that it’s marked as HW Glossy photo 2 for the x100 printer range. 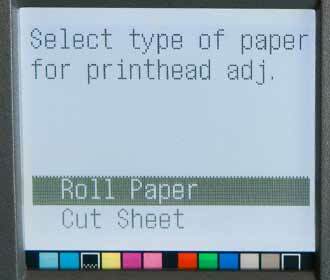 This paper setting isn’t there on my 8300, so I loaded an A3 sheet to run the paper adjustment test, after specifying a paper type from the weight and finish, created a custom paper setting. The media configuration tool allows you to load this into the printer. Afterwards I printed a profiling target. So now I can load IFA-49 paper and know that I’ve optimised print quality to a large degree. Looking at various online resources I can see that Premium Glossy Paper 2 280 and Premium Semi-Glossy Paper 2 280 are suggested for several papers as media settings. When I looked at this paper some time ago I found it a bit too delicate for my taste – taking several sheets to get a good print from the Epson4880 I was testing. Note that it was an early sample pack from Epson, so I’d expect the paper to be better now – given how often it gets mentioned I’m assuming my problems with it at the time are not common today. The print looks fine until I get the light to reflect off the surface. There is a fine mark on the paper surface – it starts about 2.5″ from the leading edge and runs the length of the paper. This suggests that something in the feed path is rubbing against the paper. Note that this is a slight dent in the paper surface – what you can see is -not- a scratch in the ink. Of course, I’ve been back to other prints I’ve made and there is no sign whatsoever of any mark. 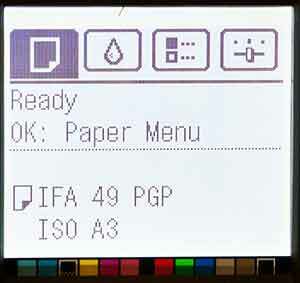 Given that Innova ultra smooth Gloss (IFA 49) is similar (very similar ;-) in finish to the Epson TPP and shows no marks, I don’t see the surface marking as an issue (YMMV). I’ve tested some of the many other assorted papers that I’ve got samples of, loading them and unloading to see if there is any sign of marking – I can detect no other marks. 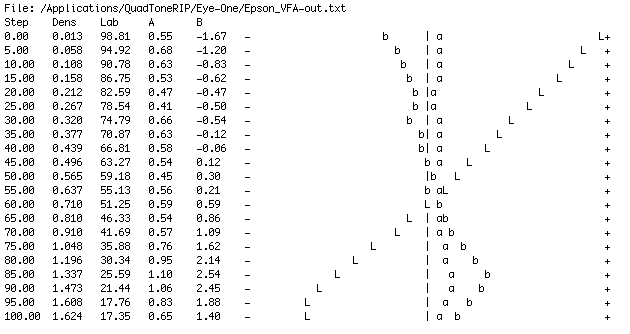 Given the discussions in the LL thread mentioned above, and my original experience when reviewing the 4880, I’m quite satisfied that this problem is one found with the Epson ExF paper alone. Just appeared on the Canon US site is new driver software adding 64 bit support – so I can at last run all my plugins in CS5 and 64 bit mode. a) 64-bit version Photoshop has been supported. b) Processing method of monochrome photograph printing has been changed to improve the representation of dark areas. c) CMYK input has been supported. d) The alignment sequence of the proof profile list has been changed, so that CMYK profile is displayed above RGB profile. e) Changed so that media display appears by category. f) Changed so that when using ICC V4 profile, OS standard CMM is available. 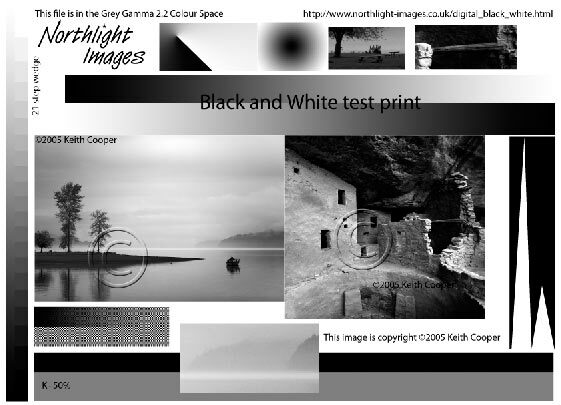 a) Processing method of monochrome photograph printing has been changed to improve the representation of dark areas. b) In Windows Vista or later, CMYK input has been supported. c) The alignment sequence of the proof profile list has been changed, so that CMYK profile is displayed above RGB profile. d) Changed so that when using ICC V4 profile, OS standard CMM is available. Note the following limitations when using this software. 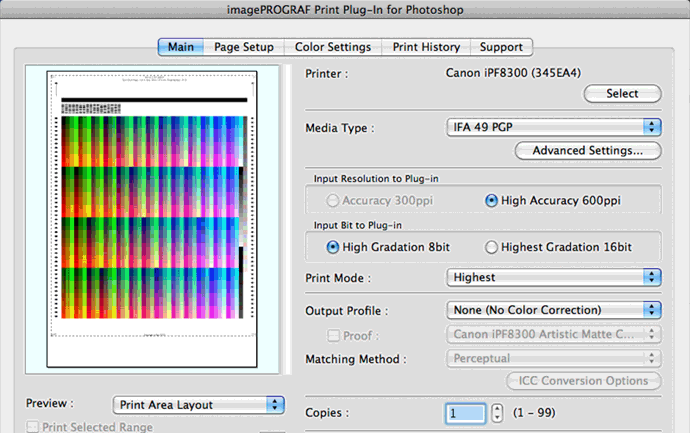 – Make sure that the data to be managed by Print Plug-In is RGB/Gray/CMYK 8-bit or RGB/Gray/CMYK 16-bit image data. 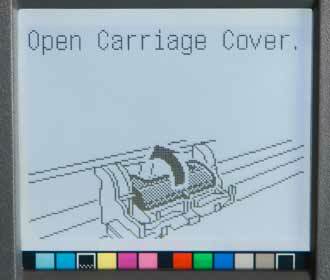 – The spot colour channel elements are ignored and the data is printed. 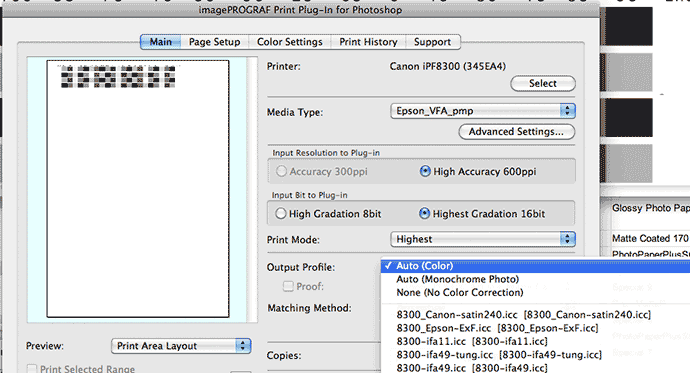 – Print Plug-In for Photoshop can handle images of width and height up to 60,000 pixels. To handle images of width or height greater than 60,000 pixels, select only a small portion of the image for processing, or process the entire image to reduce its size. 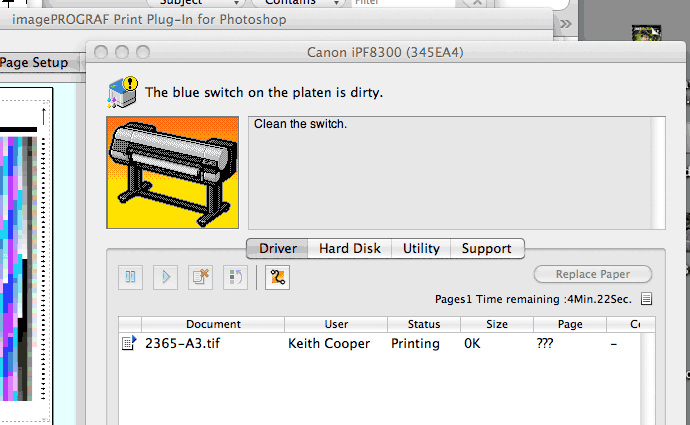 – Simultaneous output from more than one print plug-in is not possible. 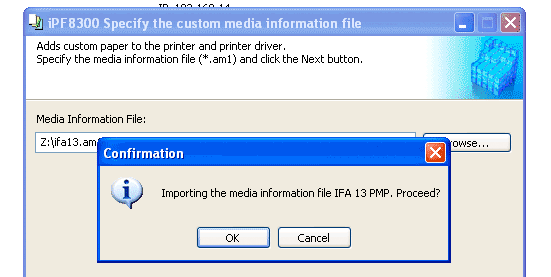 – Print Plug-In does not operation normally while Media Configuration Tool is running. 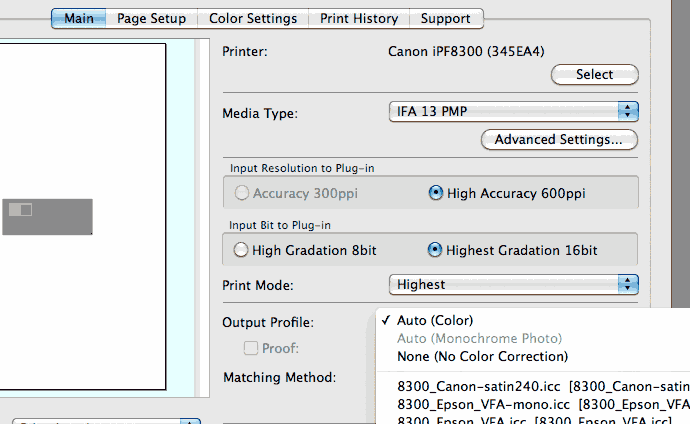 Close Media Configuration Tool before you use Print Plug-In. – The actual print results may differ from what you see in the preview or the setting values you selected for print layout in the Page Setup sheet. – Images longer than 18 m (19.7 yd.) cannot be printed. 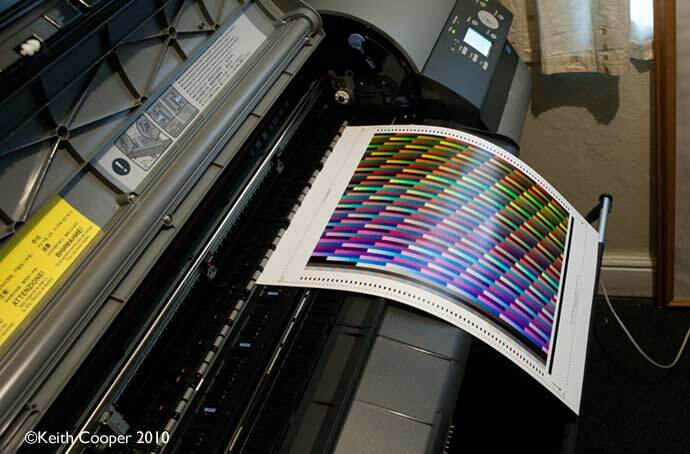 If you attempt printing images longer than 18 m, the image will be cut off at 18 m.
– If the image size is small, white space may appear at the bottom of the printed image with some types of media. – Colours may appear in the white areas of some images with some settings on the Colour Settings sheet. If this occurs, on the Colour Settings sheet set Saturation close to zero. 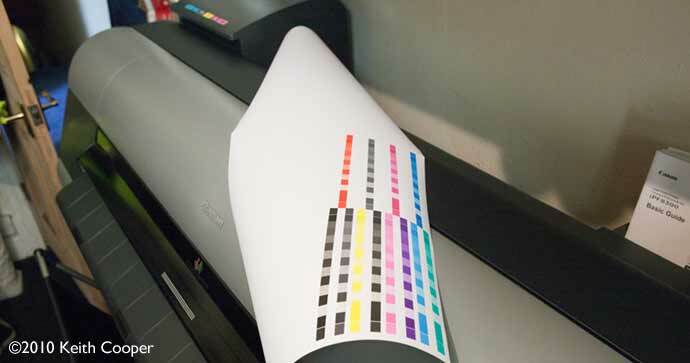 – Your monitor or the room lighting, or the ICC profiles in use may cause the colours in the print results to be different from what you expect, even if you have selected Perform Proof in Preview. 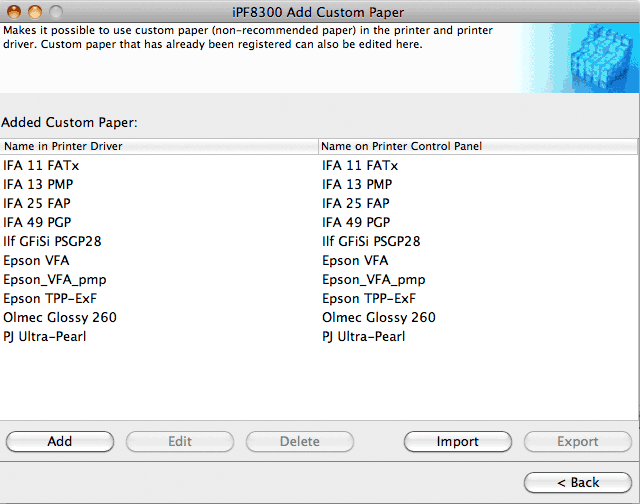 – The names of a previous printer registered once by name with the printer settings utility or printer registration applications may remain in the printer list. 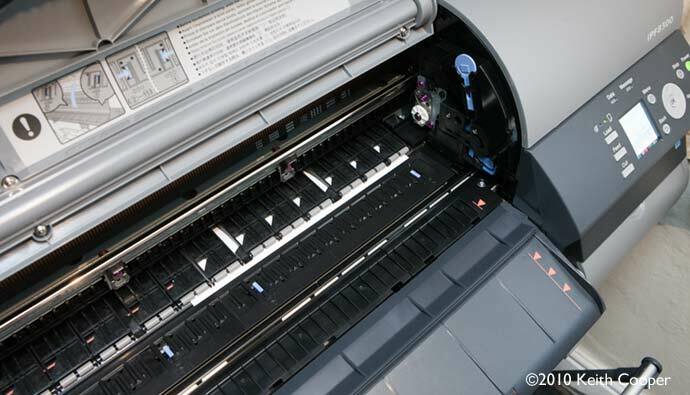 If the printer in the list is not actually connected, this will cause an error and printing will not be possible. 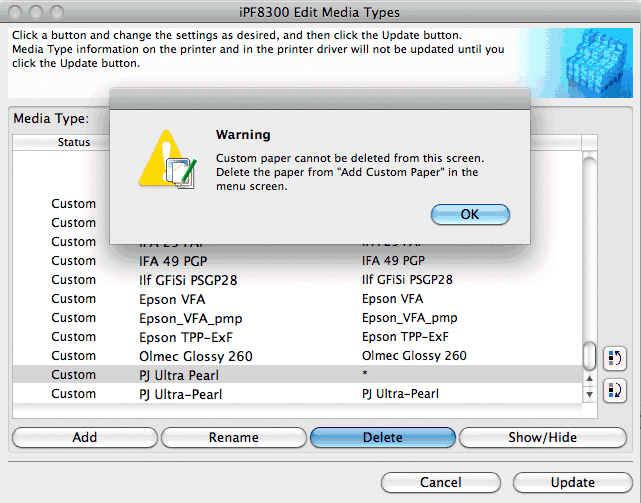 – When the printer is cancelling the previous print job, if Print Plug-In starts printing, the printer may be out of control. Make sure that the printer is able to print and then start the next printing. 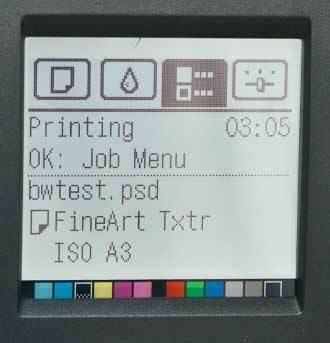 – Occasionally the printer cannot print on some paper sizes selected by the plug-in for a media source. For more details, refer to the printer User’s Guide. 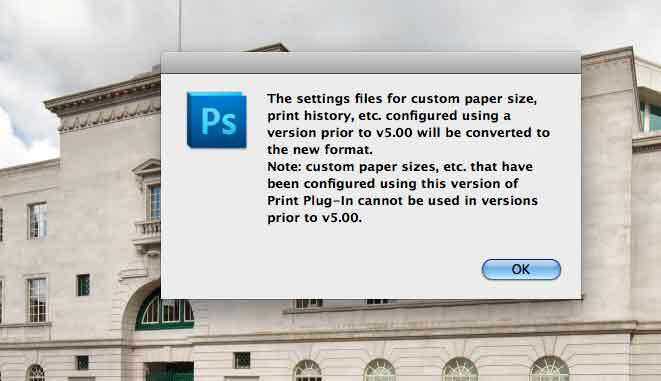 – You cannot apply Favourites, History, or Custom Paper Size created with V5.00 or later with Plug-In earlier than V5.00. Eager to see what things are like in the 64 bit world, I’m going to test with a quick print that I’ve been using for some aspects of profile testing. I remembered installing the CMM when testing the 6300 earlier this year, but just to be sure I pulled a copy from Adobe. 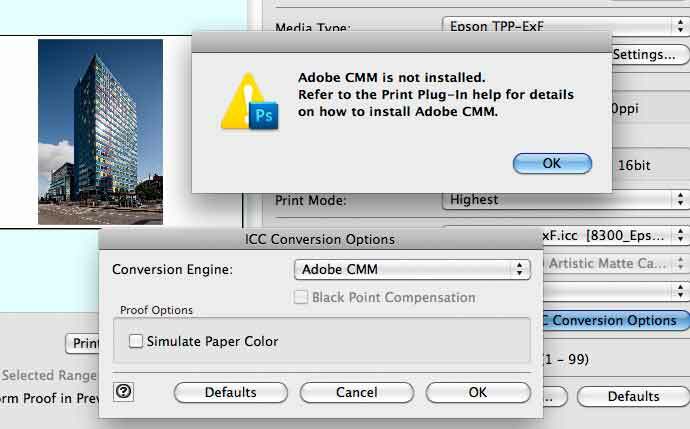 After an installation, I look at the ICC colour conversion options in the plugin, and try to switch to the Adobe CMM (it allows for BPC and makes printing with the plugin more consistent with printing directly from Photoshop’s print dialog. Then I re-read the CMM info page that’s in the help. 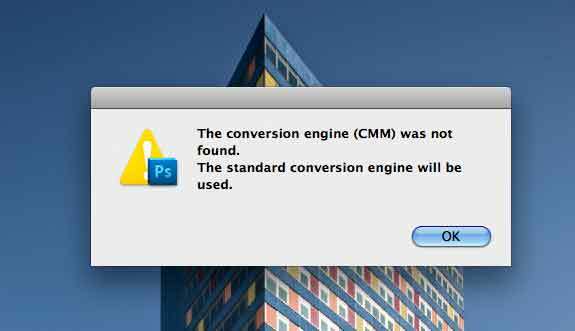 So, printing now works in CS5 64 bit on the Mac, but you can’t use the Adobe CMM – it does work fine in 32 bit though. I printed the same test target on IFA-11 paper, as earlier, and the shape of the curve is noticeably different. Move your mouse over the chart below to see two sets of measurements. For the new V5 print plugin, the main change seems to be an opening up of the shadows except for the 95-100 range where they’ve been compressed. The main aim of the graphs above was to see if there was a noticeable change and yes, there does seem to be one. Certainly enough to mean that I’d use a new linearising profile for this paper and settings. Note that I’ve not optimised media settings for this particular paper, so I’d be wary of extrapolating changes to other papers too much without more detailed testing. However, I note that only the plugin has been updated (for the Mac) – presumably this now means that the plugin prints differently to using the normal print driver through Photoshop? 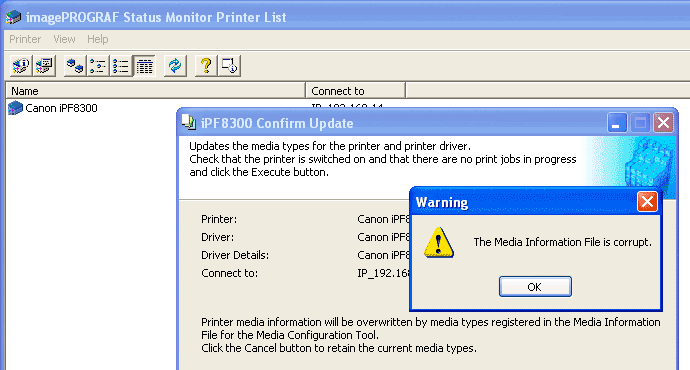 I’ve hardly been hammering the printer, but that warning keeps coming back. 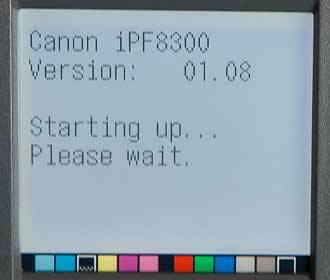 I’m waiting to hear what it might be from Canon UK – it’s not a problem for printing, I just feel I shouldn’t be getting the error. As I mentioned, I’ve boxes of sample papers sitting around, many of them quite nice, even if I’ve previously not used them much. I thought I’d experiment with some Epson Velvet Fine Art paper. It’s a thick rag paper with a ‘velvety’ finish. In the past I’ve found that I liked the look of some images on this, in particular, this shot of a wheat field in central Oregon. I chopped up an A2 sheet, into an A3 and two A4. The two A4 would do for media settings adjustments and the A3 for a colour ICC profile. After some research, I decided to have a go with the ‘Special 10’ media setting. The Monochrome option is not available for ‘Special’ media types. This did mildly annoy me, since I was sure I’d heard that the new media types in the x300 range did allow the use of B/W mode, with ‘Special’ settings. Now I know that this ‘feature’ is the same as it was when I looked at the iPF6100 a while back. So, I’ve created a second media setting, based on the ‘Premium Matte Paper’ settings. Some suggestions for media types to try for 3rd party papers can be found at the Canonipf wiki. As you can see, this particular version of my VFA media profile does– allow me to use the B/W print mode. So I’ve now got two settings – one to use with my ICC colour profile and one to use if I wanted to print in the Mono Photo mode. This is with the new driver, and shows that sharp kink in the deepest shadows that seems to be a feature of the new print plug in. 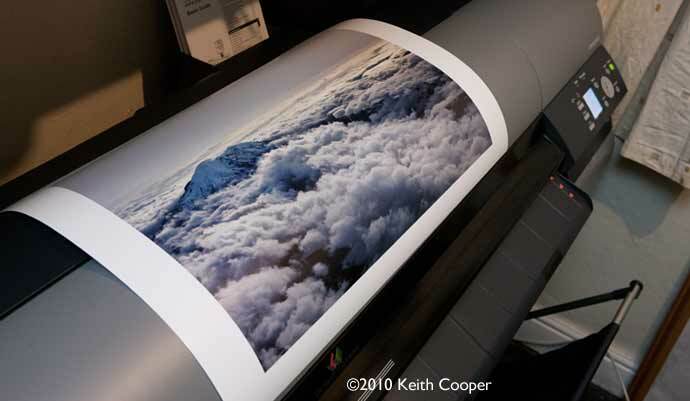 I’ve got several large prints to do before long for a client – well, once a particular 44″ roll of paper turns up, that is. Having pretty much got the hang of the Canon driver, I’m going to be looking at other software, in particular True Black and White, which I briefly reviewed at the time I was looking at the iPF6300. 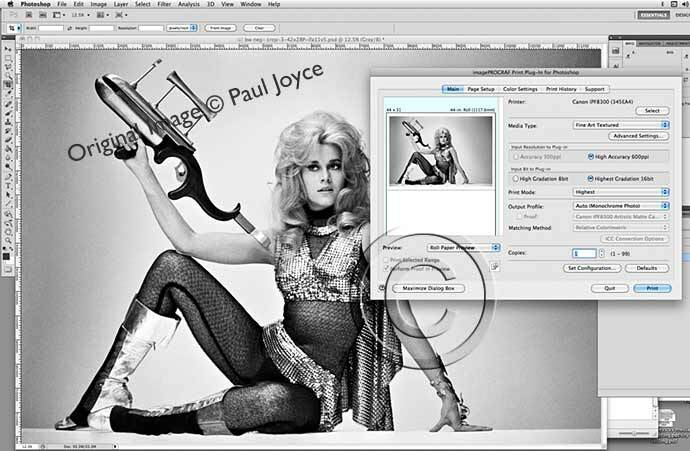 Some time ago I wrote about some of the work involved in printing a new version of a rarely seen photo of Jane Fonda as ‘Barbarella’. It so happens that Paul Joyce, the photographer, needed some additional 42″x28″ copies of this print. After some of my previous testing, I decided that printing using the Monochrome mode of the Canon driver onto Innova IFA 11 Smooth Fine Art paper would produce results every bit as good as I was getting from the monochrome print setup I had with my Epson 9600/ImagePrint. BTW if anyone has a 9600 and an older PPC Mac to drive it from, I’ve an Imageprint V6 dongle and license spare to requirements – works just great for B/W. Not sure what it’s worth, so mail me if interested? I’ve linearised the output before printing, with a correction profile, based on results from the new version of the Canon Print Plug-in. I’m still refining some aspects of my B/W print workflow, but I’m pleased with the quality of the prints I’ve produced. The photo shows several prints not long after coming out of the printer. With a stiff paper like the IFA 11, they stand very easily for drying. Note that these pictures are going to be sent in 8 inch diameter shipping tubes, so I make no attempt at forcing them to lie flat. The natural curl will be just fine for interleaving with tissue paper and shipping. I needed six prints, so after making the first one, I just went into the web interface for the printer and called up 5 more copies from the printer’s hard disk. 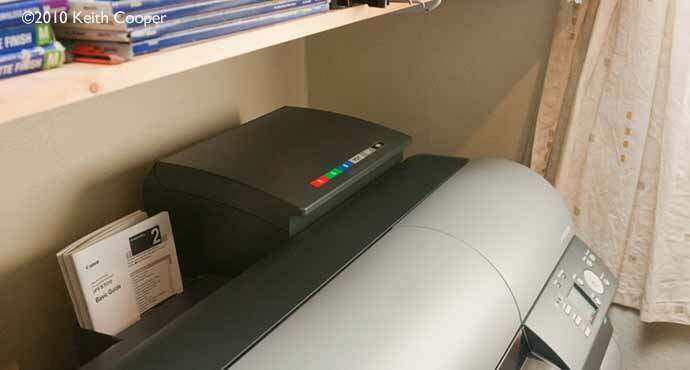 I’ve just been sent a couple of Innova papers to try with this printer. I’ll be writing up some of my thoughts in forthcoming short reviews, but a few issues with one paper warrant some attention here. I’ve a 36″ roll of Cold Press Rough Textured – 315g/m2 – IFA 13. Now this is like a thick textured version of the paper I used for the Jane Fonda prints. The key difference is the thickness – at 520 microns, this paper feels like a stiff card, so I wondered how it would feed through the iPF8300. No problem in loading it through the print path and pulling it through to line up against the paper alignment marks. It did turn out too thick to run through our iSis scanning spectrophotometer, and finding the best media settings is proving more complex than I’d hoped, but after running the automatic print feed adjustment (during the custom media settings setup) it prints and feeds well, with no marks whatsoever. Review – Innova IFA-13 Textured fine art – A heavy ‘Cold pressed’ paper coming in at over 500 microns thick. One of the irksome features of the supplied Apple Mac software is the fact that the accounting functions won’t work – you need a PC. It so happens that we’re a Mac based company, and I’m disinclined to pay for a copy of Windows just to show job costs. Fortunately, I’ve a copy of Virtual PC, from several years ago, that runs Win XP, but only on an older PPC Mac. No problem, Karen has my dual G5 PowerMac, and it has a copy of XP running. Since it’s an emulator, you can start/stop it really quickly. I can also use the Mac’s screen sharing to control Karen’s Mac, without even going upstairs to her office. Just when I’m patting myself on the back for this nifty solution, a few slight problems arise. All my custom media types appear as ‘unknown’ on the PC. ‘Unknown’ has no cost, and can’t even be assigned a dummy value. At this point I’ve had enough of this for a while and click on the job I was interested in, via the accounting software. It tells me the info I was after – the cost of the ink. This job happened to be using a sample roll of glossy paper, to reproduce some prints for a friend – the paper didn’t cost me anything and I wouldn’t normally use it for our print work. They insisted on paying me something for the prints, so at least I know what it cost me in consumables. 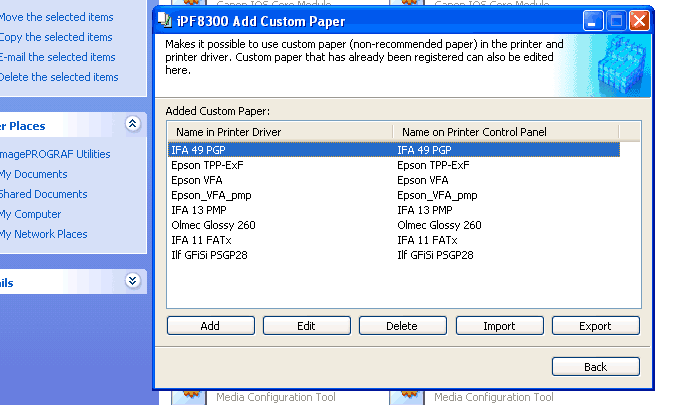 Setting up custom media types across a number of printers would seem to be a right pain. After a suggestion on the LL forum, I tried copying all files and folders in the Mac 8300 Media config tool folder to the equivalent folder on the PC – all files that is except the application itself. I then opened up the MCT on the PC and selected ‘add genuine paper’, then selected ‘update’. The tool then notices that the media settings are the same and -only- updates the driver. After things update, I check the custom media – they are there! Whilst I’ll often give away smaller boxes, 20 A3 sheets of photo paper can be of use for quick print jobs. Anyway, I needed half a dozen small prints of one of the pictures of Karen and myself. I use Innova IFA49 (Ultrasmooth gloss) for some of our large prints and remembered I’d still got a box of it from when it first came out. What I’d forgotten was that in common with many other papers of this type (from different suppliers) the sheets were prone to developing a pronounced curl. Although I thought I’d flattened the paper quite well (edge of a desk), a few minutes sitting in the 8300 were enough for the edges to lift. I resized and printed 8 copies of the image using ImageNest – remembering to use it in 64bit mode and to get ImageNest to handle colour management. A few moments after printing started I heard a noise of paper being scraped and aborted the print job. The detail shows where the paper has started to shred. I loaded a sheet of the current version of IFA49 and it’s perfectly flat. Afterwards, I looked through the rest of our paper stocks. 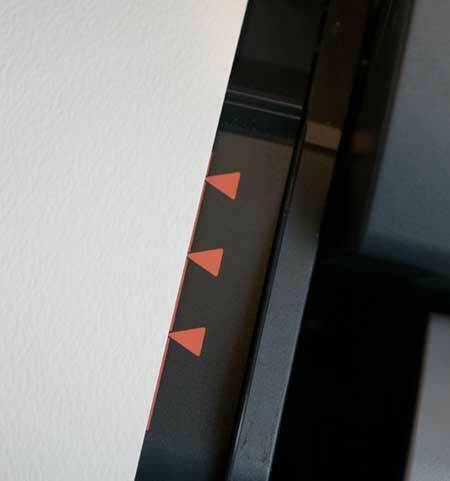 It’s worth noting that problems with curled/bent paper affect most printers I’ve looked at, such as this example (right) from our Epson 3880 review. Earlier on I mentioned how useful it was to be able to create media settings for a particular paper. For some papers, such as the thick Innova one I mentioned earlier, I’ve found that the normal setting applies a bit too much ink. 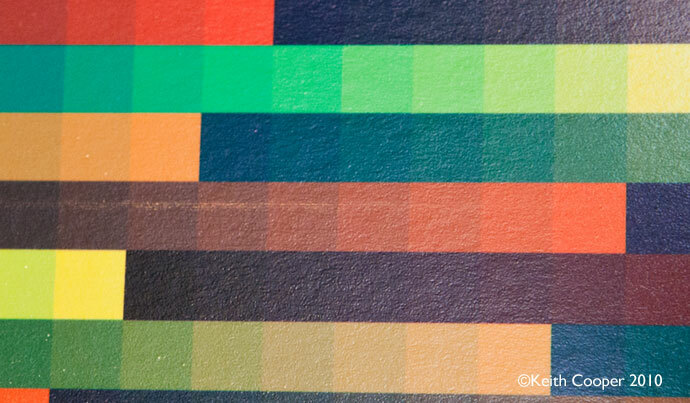 Indeed, for this paper I ended up selecting one of the lower ink limits to use when making my profiles. 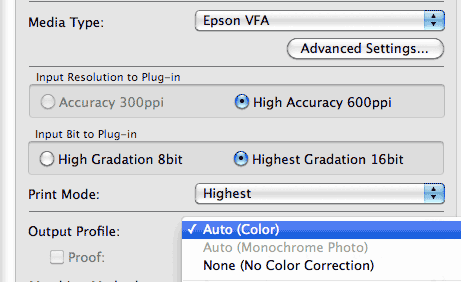 Of course I can make a new custom setting with ‘standard’ ink amounts, so I can use the Monochrome Photo print setting. Whilst you can edit custom settings, there does not seem to be a simple way to duplicate, edit and rename a custom setting. It would have been nice if selecting a non standard ink limit warned you about losing the ability to use the B/W print mode. Now it happens that I have a good icc profile for the IFA13, which gives a good neutral greyscale. One other issue I’m looking at, is the -slight- magenta tint in ‘Monochrome Photo’ images when viewed in dimmer tungsten lighting. There is also a slight greenish tint when viewed under high colour temperatures (~7500K north facing window). Wondering why the updates on this page have slowed? Actually for the very good reason that the printer is performing excelently. I’ve recent had quite an upsurge in large print sales and the 8300 is doing a splendid job. …they have been very helpful with my set-up questions and general enquiries! Before profiling I created a custom media setting. However, during the final updating of the printer (it’s in another room) it seems that I’d left the paper lever in the up position, so the process stalled. 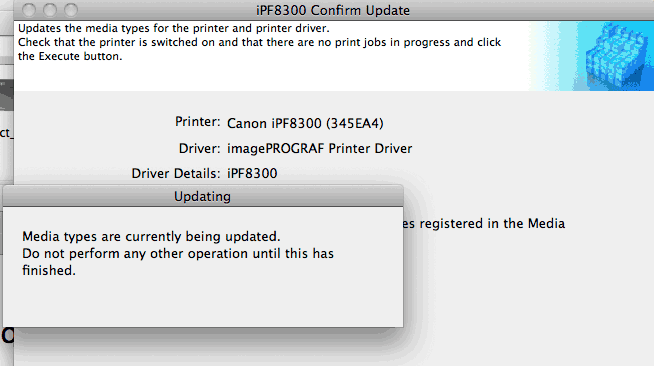 The software (Mac) then got stuck in a loop, telling me the printer was not available. The problem came after I’d let the printer restart (when I put the lever down) and had to force quit the Media config tool. It’s called PJ Ultra Pearl in the driver, but ‘*’ in the printer’s media list, both here and via the front panel. The PJ Ultra-Pearl setting is where I had another go later and successfully created a media setting for testing. Whoops – the ‘*’ paper type isn’t there. So, I have a paper type called ‘*’ on the printer that I can’t see any way to delete. We don’t use PCs at all so I couldn’t help, but they’ve kindly sent me info on what they found. Just as with the Mac, there is no 64 bit version of the CMM, so you end up printing via the system CMM. It’s this that has a problem -if- you have an alpha channel in a ProPhoto image. 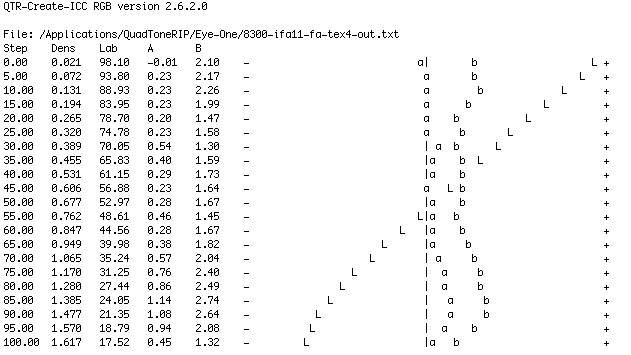 This appears with some stitching progams in the output image (I found it in Stitcher a while ago). Seems the problem goes if you remove the alpha channel. 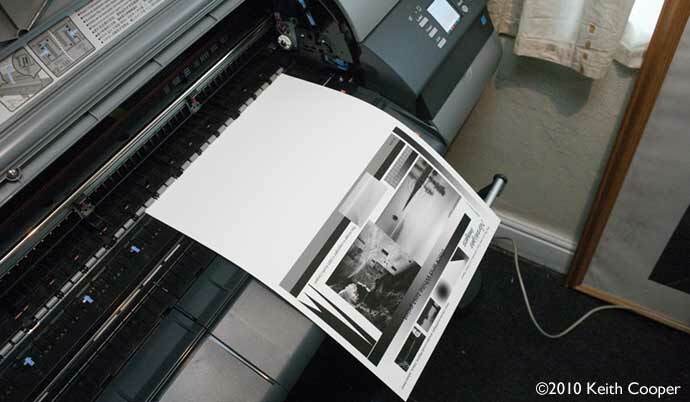 The printer ‘just works’ – I’ve had no paper feed issues or print quality issues whatsoever. 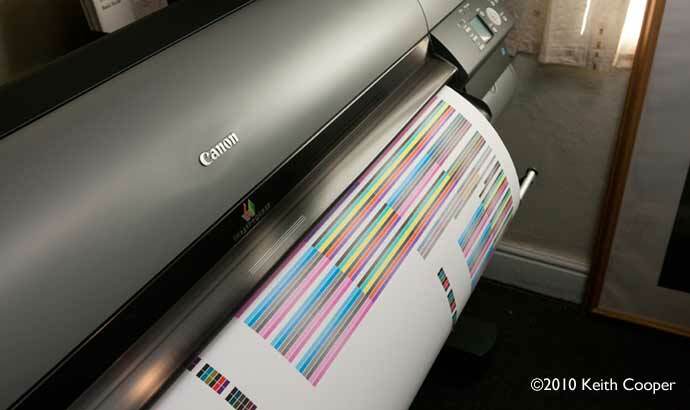 The latest i1Profiler software makes just great profiles with 2900+ patches on an A3+ sheet. I still get the request to ‘clean the blue switch’ every so often, but it doesn’t seem to cause any problems. The phantom media type I created a while ago is still there. With unbrightened papers I’m using the Canon B&W print mode set at neutral, whilst with brighter (with OBA) papers I’m adding a slight correction of -8 to give a better overall look in mixed lighting. This is covered in much more detail in my recent ‘Colour tints in B&W‘ article. The printer is giving sterling service, and I’ll be testing two new paper types shortly. I’ve also heard of an issue concerning borderless printing on wide paper. It seems that borderless only works up to 42″ width. That’s fine if you use 42″ width paper? Only problem is that sometimes papers are not quite cut correctly, and a roll turned out to be 42.125 inches wide. I’ve started putting larger carts into inks that I use more of. 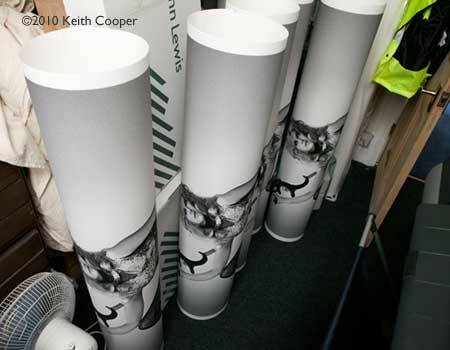 Making of the large 14m Leicester print Keith’s May 2012 exhibition in Leicester features a single iPF 8300 print just over 14 metres long. 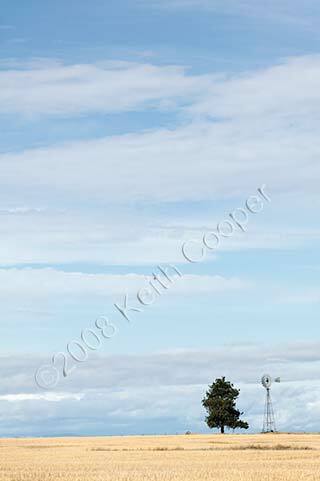 This article covers all aspects of creating this image, from Keith’s initial experiments with panoramic photography, through to the problems of printing and mounting such a photograph. In the US, there are assorted discount/trade-in deals from Atlex that will get you an iPF8300 for $2000. An interesting forum thread at LL about a failure of the cable connecting the print heads to the rest of the machine. What seemed like a print head failure (cyan cast to prints) turned out to be a cable fault. 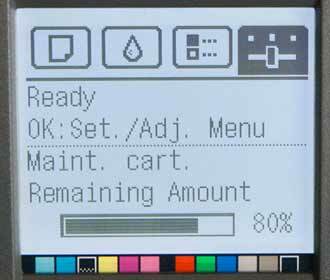 Changing the maintenance cart on our iPF8300 gives an opportunity to assess ink usage for cleaning and setup for the printer. Questions? – feel free to ask!